Slip into a nice, dreamy sleep with this Sofia 8-piece comforter set featuring an elegant damask print in calming shades of tan and cream. 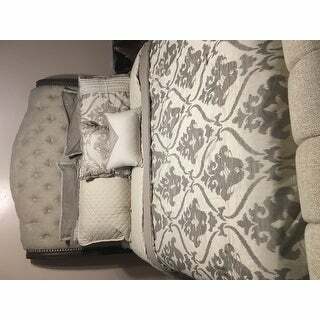 Your king or queen sized bed will look irresistible in this intricately embroidered set with multiple pillows and shams. The oversized, overfilled comforter will give you a cozy covering to cuddle with. Bar tacking details give the set a formal, finished look to complete your bedroom. Fashion meets luxury with this set and is the perfect solution to your decorative and comfort needs. This is an amazing set. Just what I was looking for. Get a lot of pieces--comforter, four pillow covers, two small pillow--for a great price. Looks more expensive. Love this comforter! It looks great with our antique white bedroom furniture in our guest room. One of the toss pillows had a small hole in it, but the comforter and shams are great quality. Beautiful comforter just as described. Very comfortable and nice weight. Was delivered on time. Really like the pillow shams and extra decorative pillow also. I bought this for my new bedroom set so excited I did it looks like it was very pricey but it wasn't if you need an elegant look this is it made well I added more pillows for a little more color looks amazing. This set is high quality and looks exactly as you see it in the picture. I can't see any difference in quality from a $$$ set when comparing. Highly recommend this set! I love it. It has simplicity and elegance and it's a beautiful set. I appreciate that the set included all the shams covering and decorative pillows. I'm very happy with my purchase. I'm looking forward to purchasing another comforter set shortly for my daughter's room next. Love this bed set. The colors are neutral but the pattern brings style to my bedroom that appeals to both my husband and myself. I wish the comforter was fluffier and 1 more euro sham needs to be added to the king set to make a complete bed. This comforter set is perfect! The set is very rich looking and lays very nicely on the bed. The color is a true taupe and cream. The accent pillows complete the look! Very pleased! Just like the picture. True to color. This set is so pretty! Colors as pictured and really comfortable. I'm so happy we got it! Overstock always comes through with fast delivery, I was very impressed with this comforter. Nice beige background and the print is a neutral grey/taupe. There is a nice texture to the material that looks more expensive than what it was. The embroidery is a subtle but nice touch. Great comforter set! Great deal for everything you get. It looks lovely on any bed. The material doesn't look or feel cheap. Definitely recommend. Very pretty set. It seems more gray than tan, which was slightly disappointing, but it still works in our bedroom. I find it to be very comfortable too. I would definitely recommend this comforter set if you're looking to update your space. Looks really chic and modern. Beautiful exceed my expectations. Color is perfect. Pretty but the material did not hold up for my Master bedroom. Rough and corse with wear. Used 6 months and donated. Would be nice for guest room if not used daily. Pillow shams were sheer. The color is a bit off from the photos but still a very beautiful. It also shipped promptly and arrived very well packaged. Way to go Overstock! Great comforter and good buy. "My queen size bed is very high off the floor. Should I order a king size?" In my opinion, yes. I hope it helps. "I notice that the Euro shams are not the same color in the picture. One looks white (or off white) and one looks taupe. Which color will come with the set? How many pillows total come with the set? In the description, the pillows are described in singular form except the "decorative pillows"." The colors go pretty well together and it all works , not really taupe . I was amazed at all the pillows, it really made my bed look classy and it all looked great . Thanks for the feedback! This was a great help! Cant wait to order. "Would the queen be OK for a full size bed? Or would this comforter be way too big and hang onto the floor?" I have it on a full bed does not hang on floor. I bought king size for queen size bed and it is perfect. Always go up a size unless you are using a valance. "What is the color of the pillow stamps, is a lavender color?" I would describe the design as being gray-taupe and the background as cream. But the solid-colored ends of the shams with a lot of vertical stitching, are more of a very, very, very light pink or peach--not the same color cream as the background of the comforter. The description for this set says it is tan. No way is it a yellowish-brown. "what's the comforter background color ? is it more a white or an ivory it also it says its reversible do you a picture of the other side I don't see one"
The background color is more Ivory than a white. It is the taupe color (or mushroom) on the reverse side. It is very good quality and the Euro Shams really make it pop. Love it!!!!! "Hello Does the king come with 3 Euro shams? If not is there somewhere I can purchase a third? Thank you, Jenny"
Hello Jenny, it comes with 2 shams and we do not have them on site separately. Thank you for shopping with us. My husband and I bought a king size bed and chose this comforter set. It is very pretty however, now that I have purchased pillows to fill all the shams I see the need for a third euro pillow sham. It looks odd to only have 2. Three would balance the bed much better. "Does the comforter set come exactly as shown in the picture?" Hello vanessa, yes the picture is very accurate. Please let us know if you have any further questions.